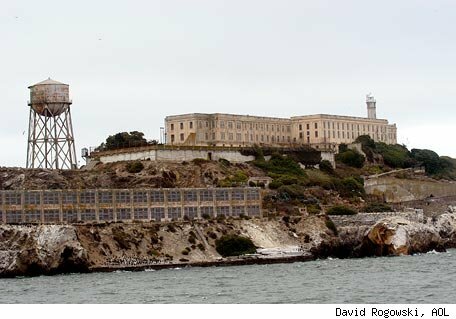 Alcatraz prison: similar to punctuation prison, only harder to escape from. Two independent clauses cannot be joined by a comma. Two independent clauses joined with a comma are called a “comma splice.” Comma splicing is illegal and if you do it, you will go to punctuation prison. A big hairy dog tried to catch my cat, Pixie. He got a broken leg in the incident. Don’t mess with my cat. Dogs stink, dogs chase cats, a big hairy dog tried to catch my cat, Pixie, he got a broken leg in the incident, don’t mess with my cat, he bites. Pretty much everybody does this sometimes, but it’s wrong. Even teachers do this sometimes, by mistake. A Maths teacher did this once on your report, but your English teacher found the error and corrected it. It’s a common mistake to make, but it’s a MISTAKE. It’s incorrect. Don’t believe me? Read a book. Read a newspaper. Read a professionally produced website. See any comma splices? So, you ask, how can we join two independent clauses if we can’t use a comma? You know already. There are lot of ways to put ideas into correctly-formed sentences. You just have to pick the best way instead of just throwing commas around willy-nilly. Use a joining word – and, but, so, because. Be careful – some joining words are meant for joining paragraphs together, not sentences. If you use a word like “however” or “moreover”, you will still be producing a comma splice. Using a joining word to eliminate a comma splice produces a compound sentence. Don’t use too many joining words in one sentence or you’ll get into run-on sentences, which are great if you’re a five-year-old telling a story to your nanny, but not so good for secondary students trying to get good grades on written exams. Use a semi-colon instead of a comma. Use semi-colons to join sentences that are very closely related. Make one of the independent clauses into a dependent clause by modifying or embedding it into the other. For example, you could use our sentences above: “Dogs stink. Dogs chase cats.” Dogs can be described as stinky using an embedded clause: “Dogs, which stink, chase cats.” Using a modifier or embedded clause to replace a comma splice produces a complex sentence. Write the independent clauses as separate sentences. Replace the comma in the comma splice with a full stop (period) and capital letter. Using full stops and capitals to replace comma splices produces simple sentences. Epic Sax Guy - practice makes what? PRACTICE: Now that you know about the evils of comma splicing and how to avoid them, rewrite the passage above eliminating the comma splices using any and all of the methods suggested above. Learn everything there is to know about commas with Owl: Yay! Thanks for reading. Read on, read on... at www.kiborrowman.net.